Fitness management services are the foundation of our business, but did you know we also offer an array of consulting services to support communities who do not staff with us? While it isn’t quite the same as having our qualified staff on the ground daily at your community, many clients have found a consulting partnership with NIFS to be advantageous in connecting their own staff, amenities, and more with an industry expert who can provide them with the direction and resources to elevate the programs they are providing their residents. Facility layout and design: As operators of fitness centers across the country, we know how to make spaces flow for improved member experience and overall function. We also have national buying power with top equipment manufacturers to bring your facility the right equipment for your users. Whether it’s a fitness center or pool, we can help you identify the right pieces of exercise equipment to incorporate into a creative and expertly designed space. Staff hiring and training: From group fitness instructors, to personal trainers, to fitness managers, finding the right people is at the heart of what we do, and our interview and vetting process helps us find the best of the best. If you are looking for support in recognizing fitness qualifications and making the right hire for your community, NIFS can lead your interview process. We can also aid in the training process once you make your hire to get your new team member on the right path and connected to NIFS resources and programming materials. 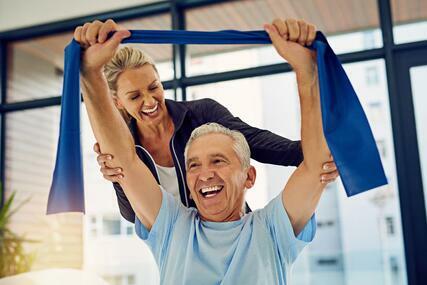 Wellness program design: Let us help you identify fresh opportunities to create purpose and intention in the lifestyle cultivated for your residents. We know how to break down the silos and bring together enrichment, health services, fitness, rehab, food and beverage, spiritual services, and more for seamless programming that is both seen and felt by your residents. Conceptually, many communities struggle with getting these key stakeholders in resident well-being collaborating with a unified vision, and we can help you bridge this into reality. Data collection and evaluation: It’s difficult to determine how effective your programs and services are and how many people you are reaching consistently if you don’t have data to evaluate. We can help your fitness staff develop an efficient system for tracking participation data, identify key benchmarks to measure and evaluate over time, as well craft SMART goals to continually strive toward program enhancements. Group fitness program design: Residents love their group fitness classes, but are you certain that your community has an array of classes to address the main components of fitness throughout the week for varying intensity levels? We have a niche for developing robust group fitness programs as well as best practices on how to market the classes, how to attract new faces, and how to keep the classes fresh so that this resident favorite at your community reaches more individuals and remains strong. Even if your organization does not avail itself of the full range of fitness management services that NIFS offers, you can still consider consulting with us on specific pieces of the puzzle to strengthen your fitness and wellness offerings. Not sure what to expect when utilizing our consulting services? Check out our quick read below for more information. We all know that fruits and vegetables are good for us, right? We hear it all the time that fruits and vegetables lower the chance of certain cancers, eating your spinach will prevent cataracts, eating fruits leads to longer life and beet juice lowers blood pressure. We also know that fruits and vegetables add color and texture to our dinner plate, they are low in calories and provide fiber, vitamins and minerals for our body. So, if something is good for us, why don’t we embrace it and take it all in? Well, it is not as easy as it sounds. For many, it may be the taste factor and immediate satisfaction of good tasting food, overrides thoughts of long-term health. Were you forced to eat your vegetables when you were younger? Possibly the half eaten peas and carrots that were in your mouth became the new center piece at the dinner table? 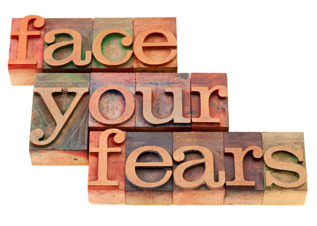 Bad experiences tend to keep us away from trying it again. So, what are the top 3 reasons to increase fruit and veggie intake? Why would I want to give these foods another try? 1) Fruits and vegetables provide benefits for my overall health. This requires a change of thinking to actually believe that it will provide long-term health benefits, so the eating choices I make today will affect me in the days, weeks, months and years ahead. Research has spoken and the results have been proven that fruits and veggies are good for us. 2) Maintaining at least half my plate with fruits and vegetables with protein and some small amounts of grains, provide steady blood glucose levels. I do not experience the high spikes of blood sugar that can be caused by eating a lot of foods that are on the high end of the glycemic index. I feel better and have more energy by following this rule. 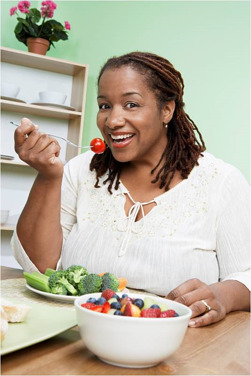 3) Eating more fruits and vegetables and eating less sugars and grains provide a healthy body weight. How much sugars and grains do you consume in a day? If you have been trying to lose weight and have had a hard time getting the weight off, you may want to look into what you are eating. Whatever your experience was like, don’t give up on fruits and veggies. Give it another try. You may find that it is one of the best things you could do for your health. What are your reasons for eating more fruits and veggies? For ideas on how to incorporate fruits and veggies into your meals contact your fitness center staff. In part I of this blog series, we discussed opportunities to develop a comprehensive Olympics-themed program that would create a more memorable experience for participants as well as opportunities to attract more resident interest in the events. In the second part of this blog, we will explore a variety of events that you can consider folding into your Olympics to compliment the recreational activities your residents already know and love or to take a different path all-together. Weekly recreational offerings with a strong resident following might seem like low-hanging fruit when it comes to spinning off an event for an Olympics-themed program. However, creating a flyer with your own Olympics logo and inviting these participants to a “special” tournament one afternoon can be less than inspiring for residents. Read on to broaden your horizons on additional events you can pull into your next Olympics adventure. You’ve probably considered croquet, putting contests, corn hole, shuffleboard, bocce ball, ping pong, water volleyball, billiards, etc., but have you considered adapting your own versions of the following? Frisbee Discuss: Play it indoors or outdoors and mark targets at varying distances. You can use hoola hoops or simply use tape to mark off the targets. You can designate varying point values for the different distances or recognize participants by the number of Frisbees that hit inside or on the target. Water Balloon Shotput: Teach your residents how Olympians throw a shot put (without or without the spinning in a circle…OK, probably without the spinning) but use a water balloon! Measure the splash marks and who can shotput the water balloon the furthest distance. Wii: Many residents are already familiar with Wii bowling and golf, but consider purchasing the Wii Fit if you don’t have one and allow your residents to hone their skills on downhill skiing. Wii also has games for archery, hunting & target practice, and many other options that might appeal to your residents. 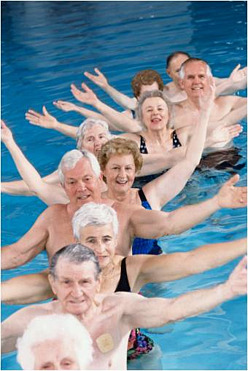 Synchronized Swimming: Planned well in advance of your Olympics, you can have small groups of 3-4 residents compete against one another in synchronized routines they develop or have one large group of residents work together to put on a spectator sport for the entire senior living community. Perhaps you could host your Opening Ceremonies in your pool area to increase exposure of this wonderful amenity your community has to offer! You’re Olympic events don’t necessarily have to be recreation or fitness related. Finding other ways for residents to compete can be a great way to attract more individuals to participate. Scavenger Hunt: Take pictures of random artwork and landmarks inside and outside at your community and provide these snapshots to participants. They will embark on a scavenger hunt trying to recall where they’ve seen these different items throughout the community and will visit each location. You can make it a timed event for the top three finishers or do recognition awards for everyone who makes it through. Brain Trivia: Host a Jeopardy or other trivia type event for residents to promote intellectual wellness as part of your Olympics. For a large turnout, you can have multiple games going on at different tables simultaneously, or you can have residents work as teams for the answers. Let your creative juices flow in developing a comprehensive and fresh approach to your next community Olympics! If you like what we have shared, check out our Best Practice Series featuring 11 of our Best Practices we have implemented in active aging communities! It’s MAY, birds are chirping the sun is out and oh yea watch for blinky lights and reflective leg bands, bike season has started! While some dread sharing the road with the two wheeled, foot powering transportation others love this chance to take advantage of the trails and bike lanes in your city. Well the truth is you SHOULD! Step outside of your normal comfort zone and bike to the store or run other errands while getting some exercise in! Air: Check the air in your tires. They should be inflated to the maximum rated PSI, you can find this number on the side of your tires. They should be inflated to the firmness of a basketball if you don’t have a pressure gauge. Brakes: Brakes should be in working order if they stop the back when pushed forward or backwards. Brakes should be in working order if they stop wheels when pulled. Chain: Chain should move freely, lightly oiled and rust-free. May 12-16 is Bike to work week this supports all levels of bikers to take advantage of active transportation. Here is a great website to get tips and tricks on biking to work or everyday biking. 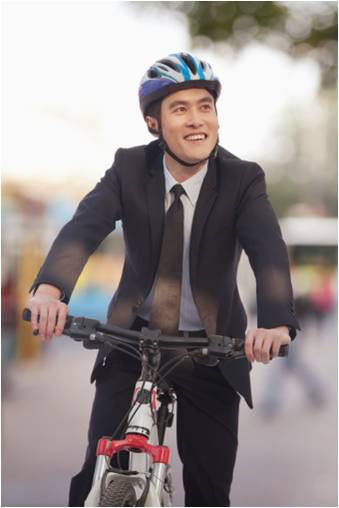 Check into other employee benefits at your work such as a bike commuter reimbursement. 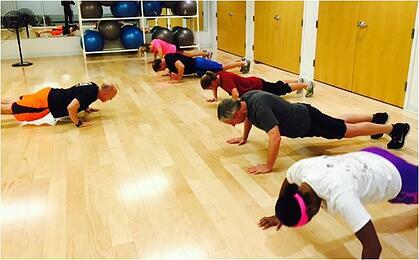 How is your company promoting worksite wellness for employees? 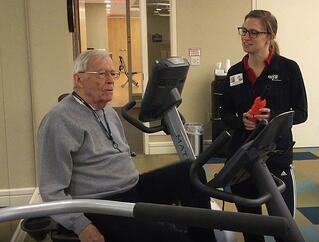 Our staff offer great programs to encourage employees to get healthy. Opt in to our Best Practice Series to receive 11 of our Best Practices implemented by our staff. To my knowledge, I don’t think there’s ever been a survey taken regarding this issue but personally, this is one of the most frustrating things to hear as a personal trainer, group exercise instructor, fitness manager, fitness specialist…fitness ANYTHING! So let me be clear right from the beginning. Lifting weights will NOT make you bulky. Time – This applies to a couple aspects of life. First of all, do you realize the amount of time these muscle-bound men are putting in at the gym? We’re talking two+ hours in the morning and two+ hours in the evening…at a minimum! Most likely they may be getting in an afternoon session as well. Possibly even a little cardio at some point in the day. And to be specific, each two+ hour session is most likely focused on one muscle (i.e. chest day, leg day, arm day, etc.). 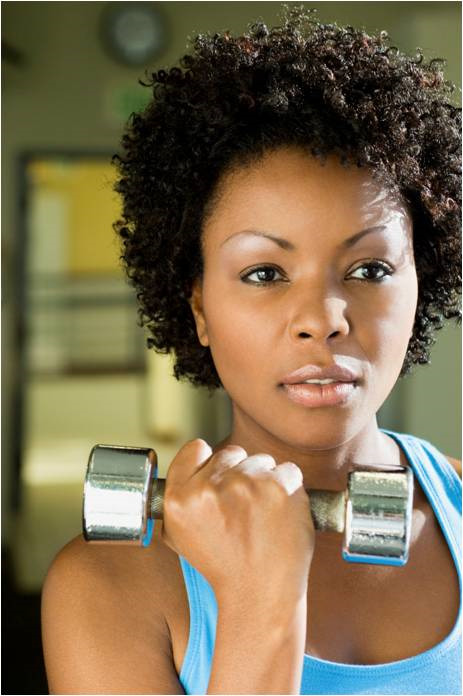 Chances are you are working out one hour per day at most and doing a full body workout. There is not a chance you will get bulky exercising in this fashion. 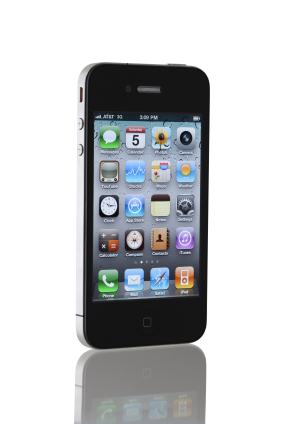 Diet – This is the second aspect of time consumption. The planning that goes into each and every meal throughout the day and throughout the week is staggering. 6 meals a day; no cheat meals; getting a well-balanced diet throughout each day (i.e. getting enough protein, natural vitamins, water, etc. ); and staying on schedule with each meal and/or snack. This takes A LOT of time. But it’s for good reason. A great workout plan is not much without a clean diet. These big guys need enough nutrients for their muscles to grow. They cannot have little cheats here and there…a candy bar in the afternoon for a pick-me-up, an alcoholic beverage while relaxing with friends, any sort of pastry to eat while they drive b/c they are late for work. No. They are very strict with their clean diet. Can you honestly say you are that strict with yours? As I previously stated, these are only a couple of the reasons you will NOT get bulky simply by lifting weights. Unless you are purposefully trying to get bulky and basing your lifestyle around it, you don’t stand a chance to do so. On a positive note though, lifting weights will definitely help you target those trouble spots you’ve been trying to get rid of…the back of the arm, your lower back, your thighs. The next time you give yourself a goal of losing 10lbs, I challenge you to accomplish this feat through lifting weights, not by jumping on a treadmill for 30 min. I think you’ll be pleasantly surprised with the outcome. Connect with your corporate wellness staff to help you get started. They can set you up with a plan to meet your goals. So get out there and start lifting to NOT get bulky!